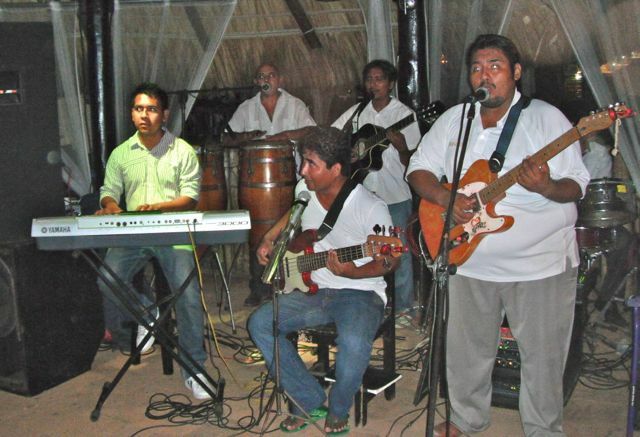 While rock groups come and go, salsa is the mainstay of live music in Puerto 52 weeks of the year. Many of the musicians have deep roots in the community, and it has been a real pleasure for me to watch them evolve over the last six years. 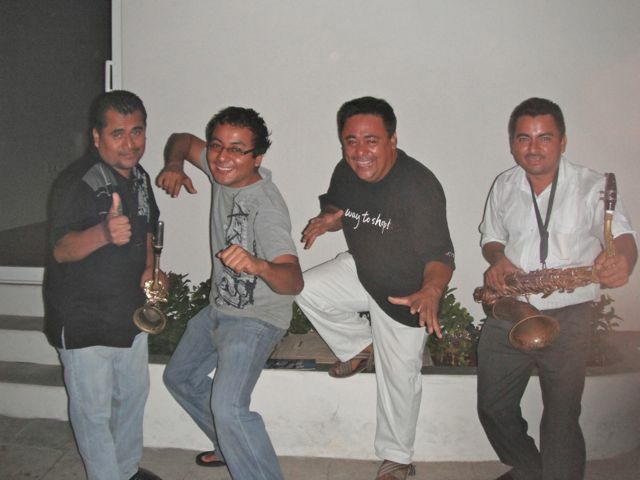 Back in 2007 when the Split Coconut was in the old Jardín Real (now the Albatros) in Bacocho, the house band was the trio of David Rangel (conga), Daniel Santiago Ramírez (guitar and vocals) and Rosella Pezzotti (vocals). When owner Brad López asked what they wanted to be called, almost as a joke they borrowed the name of a very cheap brand of tequila, “Viuda de Romero” which Brad had at the bar. In 2008, Rosella was replaced by Victor Rojas (keyboard and vocals), and the group was also performing at Congo on the Adoquín. The Viuda broke up in 2010 with Victor Rojas forming a combo that came to be known as Son Latino. Daniel Santiago and David Rangel joined with other musicians to form a much larger group, Los Santos Inocentes. Not surprisingly, both groups perform many of the same songs. The newest band is La Noche (formerly “Radioactivo”). It too plays many of the same salsa standards like “Montón de Estrellas” as the other two groups. If the measure of a salsa group is its ability to get people dancing, then I have to report that all three are equally successful. Some individual musicians may be better than others, but what really counts is the over all effect. Puerto is very fortunate to have three bands making good dance music three or four times a week during the high season. Tip to the shy: don’t be afraid to dance. Salsa dancing in Puerto is not a competitive sport. Some people dance slow, some people dance fast. Not everyone can keep to the beat. The goal is just to have a good time. Los Santos Inocentes performs at Kabbalah every Saturday night. La Noche and Los Santos Inocentes play on alternating Wednesdays at Congo. Both shows start at 11. Son Latino plays at Rockaway every Friday at 9. La Noche: (954) 103 1997. Santos Inocentes: (954) 109 7133. Son Latino: (954) 108 9427.